I have been nominated for the prestigious Liebster award. Many thanks to Maddy at Home for the nomination. The Blogging 101 online course is all about introducing new bloggers to one another, and we are all finding new friends, discovering new blogs to follow and out of all this love comes the sharing of the Liebster award. 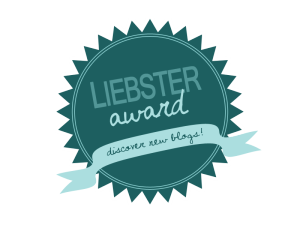 The Liebster award is not an actual award you can hold in your hand, but you get to share your blog with more people, nominate others for this award which will hopefully encourage them, and you can post the logo on your blog. Maddy put a lot of work into researching the Liebster award, you can read her great blog here Wherefore art thou Liebster? She explains about the various types of blogger, and I would count myself under the category of ‘people pleaser’. I don’t want to offend, and it feels good to have the nomination! Here are my five questions for you to answer if you choose to. What time of day do you usually like to write? When you write, do you prefer silence or some background noise? What one thing would you do differently if you could be 12 years old again? I would take advantage of my education, and not be scared to ask the teachers things I didn’t understand. 2. If you could have had an acting role in a movie over the last 10 years, what would that role be? I would be Noah’s wife in Noah. Played in the movie by Jennifer Connelly, I’d love to live through the flood. 3. If you had to get up and sing in a karaoke bar, what song would you choose? ‘Starman’ by David Bowie. All together now…..
4. What one major change do you predict will take place in the world before 2025? A return to old fashioned, Christian values such as loving your neighbour. 5. If you could only tell your grandchildren one thing, what would that be? And finally, here are the rules! Answer the questions asked to you by the person who nominated you, and make five questions of your own for your nominees or you may use the same questions. This entry was posted in Blogging 101 2015 and tagged blogging, Liebster award. Bookmark the permalink. You asked questions to your nominess but didn’t answer yourself? Would have loved to hear about you.